Copyright 1999, Sean Kernan, Inc.
“There was an old book out on a table. I went to put it away, but instead I just opened it and gazed. I looked at the way the sharp metal type cut into the paper, at the blooms of foxing in the margins. I smelled its slight odor of papery rot, caught Latin words here and there and made out that they said something about the spirit and devotion. I stood there for the longest time. The book had stilled me. 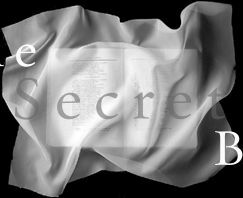 The Secret Books was published in 1999 by Leete Island Books to coincide with the centennial of Borges’ birth and, by happenstance, with the start of the long journey to the EPUB standard. The month before The Secret Books appeared the Open eBook Forum (now the IDPF) released the Open eBook Publication Structure (OEBPS) version 1.0. A coincidence Borges would have relished. Pingback: JORGE LUIS BORGES | "POÉTICAS"
Pingback: JORGE LUIS BORGES « "POÉTICA CRIATURAS DE CENIZA"
Pingback: JORGE LUIS BORGES | "SOCIOLECTOS"
Pingback: JORGE LUIS BORGES | "EL ARCO Y LA LIRA"
Pingback: JORGE LUIS BORGES | "OCULTO PARA EL MUNDO"